Cold blustery days in Taipei can be daunting. Back when we lived there, part of me would dread the heavy layer of gray clouds that draped themselves over the city basin from early November to at least early April, with only the occasional downpour to alleviate the monotonous weather. Comfort could always be found in the local food, though, which is why the other part of me could hardly wait until winter came. The street vendors in particular would do a brisk business during those long months selling piping hot treats to commuters and shoppers, who would buy these goodies as much to warm their hands as to fill their mouths. One of my go-to guys when I was even more frozen than usual was the old Shanxi gentleman who would roll a heavy concrete barrel down the street that was configured to make a constant clacking sound as he pushed it around. The barrel was shaped sort of like a traditional tandoori oven, and it served much the same purpose: it was a portable little kiln. 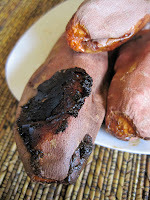 Hot charcoal covered the bottom and vibrantly orange sweet potatoes were hung by hooks around the rim; they would slowly bake into a tender lusciousness as their bottoms roasted over the slow fire and the skins turned a crispy black. Techniques like this show better than any history book how the Silk Road both changed China's cooking and pollinated local cuisines with concepts from both South and Central Asia. In fact, if you do happen to look at a map, you can see how the northern province of Shanxi has Inner Mongolia above it and Beijing a short distance to the east, with the thousands of miles of the Silk Road spreading out westward toward Central Asia. 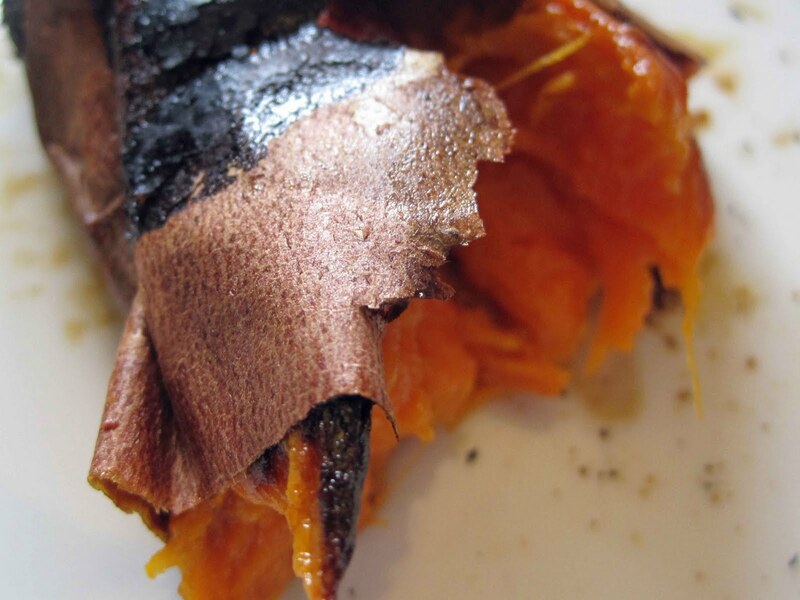 Lucky for us, Shanxi had made its way to Taipei via its roasted sweet potatoes. We would buy a couple of these gems, which the sweet potato man would wrap in newspaper before dropping them into a plastic bag. The newspaper was a godsend, because it acted as both a cushion against the fierce heat that the potatoes would radiate for at least a few minutes, and also as a sponge for any juices that dribbled out. Yes, these were juicy potatoes, two words that you probably never thought you would see in the same sentence. When cooked properly, the potatoes will ooze with juices that will first caramelize and then burn, making the house smell like cotton candy. It doesn't really matter whether you take them out covered with their natural caramel or allow the juices to turn black; it's all a matter of personal taste. If you remove them while the caramel is still brown, it will form sugary strings just like real caramel, and that is a treat in and of itself. 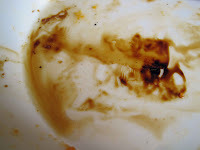 But if you wait for a bit longer, the caramel may turn black, but the potatoes become even juicier. Can't decide? Eat half at the caramel stage and half at the black... the best of both worlds! Once we had made our purchase, we would cradle a couple of these babies and make a beeline for Star Cafe, a beat-up lounge in downtown Taipei where writers liked to hang out, eat Russian pastries, and argue over cups of coffee. It's been said that the First Lady at that time, Chiang Ching-kuo's Belarusian-born wife Faina (Chiang Fang-liang), had a standing weekly order at the place. Star Cafe was decidedly bohemian and was hardly the kind of cafe where Madame Chiang could ever personally set foot, so the pastries were always delivered to the First Lady's residence, while folks like us would go there to catch up on gossip and watch the likes of a certain local poet and infamous roué trying to sneak one of his bare feet under the bottom of a young female admirer. After shouting out an order for coffee, we would tear into these potatoes just about as soon as we sat down, since the aroma would be practically killing us by then, and we would wallow in the orangey pillows that burst out of the potato skins. This simply is great snack, and so it is one of the many things I had to reproduce once we had left Taipei. The good news is that these are astoundingly easy to make at home. Only one ingredient and one baking pan are needed. That's it. I use my toaster oven since it makes this dish even more cheap and economical, but a regular oven will do, especially if you are planning to cook more than your toaster oven will hold. Be sure to get the red type of sweet potato (sometimes called a yam, but I'm not going to get into that argument), preferably the Garnet variety, which is especially sweet and moist. 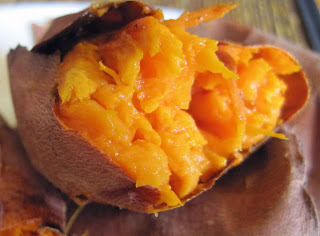 Store your sweet potatoes in a very cool, dry place with absolutely no moisture around them, which is why you should remove them from any plastic bags or wrapping as soon as you get home, as otherwise they will sweat and get moldy. Eat these roasted potatoes hot as soon as they come out of the oven with an equally hot beverage like tea or even a bowl of sweet fermented rice soup, or serve them along with a roasted bird. I feel a bit silly giving a recipe for this, since it is so straightforward, but here you go. 1. Heat your oven to 375 degrees F. Scrub the sweet potatoes well (since you'll probably end up at least nibbling on the skin). Cover a baking sheet with foil for easy cleanup if you want. Trim off any soft or bruised areas, but you don't need to prick or oil the skin. 2. Place the potatoes on the baking sheet in a single layer with a bit of space between them. Bake for 60 to 90 minutes (depending upon your oven and the size of the potatoes), until the potatoes are squishy soft and either have caramel oozing around them or the caramel has burned to a crisp. Serve as hot as possible with no adornment necessary. Oh, how I have missed these delicious bits of Heaven on cold, rainy days. My sweet Taiwanese friends would bring them to me at work late at night. The first time I ate one, my friends were astounded that a foreigner could be so pleased over something so simple, so "everyday". You described this experience perfectly! How could a baked sweet potato be so exhilarating? It's impossible to describe. Just eat and understand. Thank you for this recipe. I was missing these treats that I had purchased in Xi'an on a cold snowy day.